Even more strings. 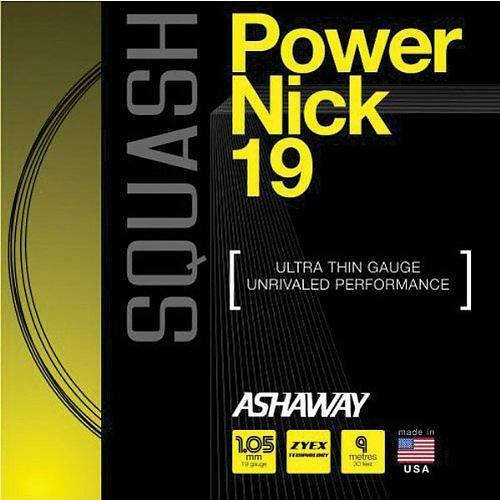 This is the Ashaway PowerNick 19 Black, part of the Ashaway squash strings lineup. 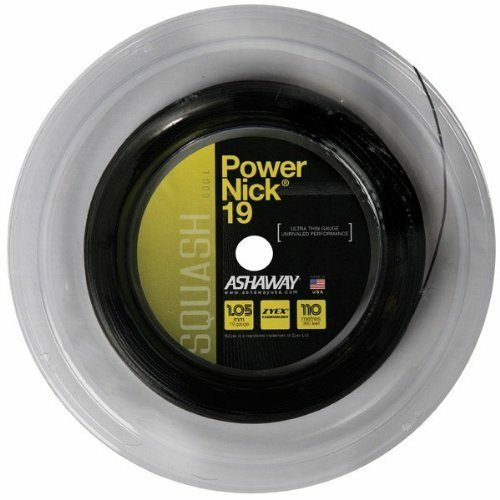 They say it’s the thinnest squash string ever made, at 19 gauge / 1.05 mm. have just restrung my two rackets( Head Graphene Neon 130 and Prince Pro Tour 850) with this tiny strings. With this string in the graphene neon 130, it feels a bit stiff(string tension at 26.5 lbs) but it make lots of improvement in the accuracy and control of the shots. The strings move a lot when you grip the ball and it sometimes help me to slice the ball for a drop shot in the front court. the cons of this string ( in my opinion ) is the power generation from the string bed. because it is stiff monofilament, i find my shots are powerless and not much ‘pop’ sounds generated when i strike a ball to the wall(if compared to the tecnifibre 350 1.10 green string). With this string in my Prince racket, it only last about a week( i play squash at least 1-2 hours everyday) so this string is not really preferrable on a long-stringbed type racket. But i find the resilience is more significant with this string in my prince racket. I like to try different strings on my rackets( now i am using Rucanor-Gosen Hy-Sheep 1.17 string on my prince racket) and my advice, dont go for thinner string higher than gauge 18 if you want nice blend of control, touch, power and resilience. I really enjoy this string, but like Zach found it a bit stiff and it doesn’t last, and the stringbed moves a good amount. My preference is the Ultranick 18, which is a great blend of control, touch and power. And it’s quite durable. You get the same power as the Powernick 18 (red), but with a softer feel. This string is meant to be a very good all round string. Never used myself, but heard it’s quite good, however it has very poor durability. That’s the price you pay for better play ability I guess!